I enjoy Twitter most days. Not all, but most. The challenge is sending comments into the void and not knowing their impact. I’ve taken a “if I like it and think the tweet is funny, I’m sending it” attitude. Certain times I have laughed by rear end off writing a tweet only to have it bomb and get no response back, which is the case most of the time. Here’s my favorite tweet that bombed because I messed up the meaning. @cffatboy in the hospital is like keeping a wolverine in your bathroom. At some point, U R going to have go in there & it won’t be pleasant. @cffatboy in the hospital is like keeping an angry wolverine trapped in the bathroom. At some point, someone is going to have to go in there and lose an essential body part. I would have violated the 140 character limit. Oh, well. I feel better now that I got it out of my system. I thank CF Fatboy for his guest post, which made me laugh so hard it helped clear out my lungs. And though I blow off steam on Twitter, I truly appreciate the people, CF Fatboy especially, who I have met and learned more about. That part of Twitter is special and I value it above all else. Tweet on, my friends, tweet on. I just watched an excellent trailer for a new documentary coming soon. 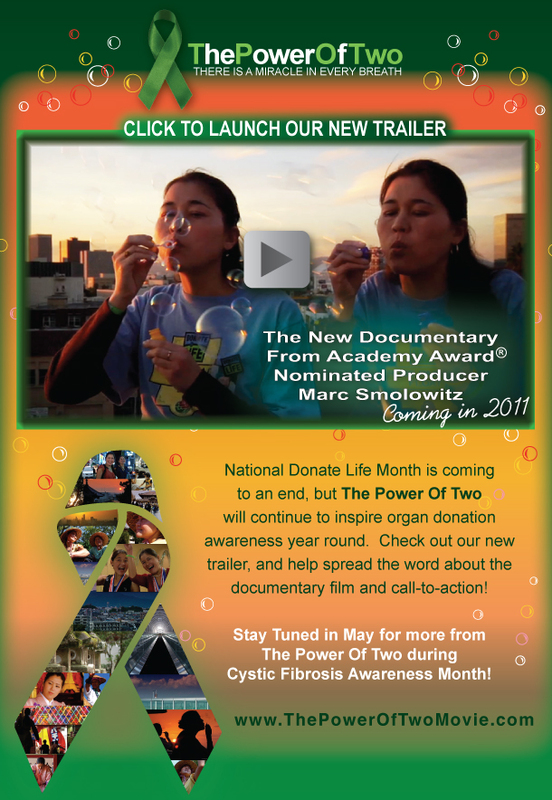 It’s called The Power of Two and its subject matter includes cystic fibrosis, different cultures, and my favorite subject of overcoming great odds in life. I won’t say anything else other than the trailer hooked me. I’ll get my popcorn ready. I’m going through man-a-pause. No, that’s not on the list, but it should be. It was all I could do today to keep from using ALL CAPS in my tweets. The number of tweets I didn’t send was higher than the number I sent. I told CF-mum Lorraine I dug her. I started three blog posts and stopped. Strange day. I also listened to Captain and Tennille’s Love Will Keep Us Together and enjoyed it. So, when in doubt, go with frivolity and horseplay. Where did those buff arms go? Hellooooooooooooo, to my first solo insertion. Neck or groin? Tongue depressor or leather strap? Nursing school in Tahiti rocked, dude! Rambo never asked for a shot of lidocaine, dear. And he had to stitch his own arm. Does Red Bull ever make your hands shake like this? Do I feel warm to you? Mind if my lover, Bart, watches? It’s okay, 5-second rule in effect for dropped needles. Cystic fi-what? That can’t be good. (bonus) Holy crap! It is sticking out of your ear and I just . . . threw up in my mask. I started this blog for you – I think. It’s not quite what I thought it would be. But that’s not a bad thing. I had good intentions. However, now it travels in its own direction. And frankly, I’m not sure what direction that is. Like a kite ripped from my hands by the wind, it floats away in an unpredictable course – high up there in the blue, its shape almost unrecognizable now. But I’m enjoying the ride. And learning a lot. Mostly, how strong other people with cystic fibrosis are and how weak I’ve been at times. Perhaps, I always knew this. However, when I coughed up blood last week, I was a little less stressed about it thanks to my new friends. I don’t know how much longer I’ll keep this up. 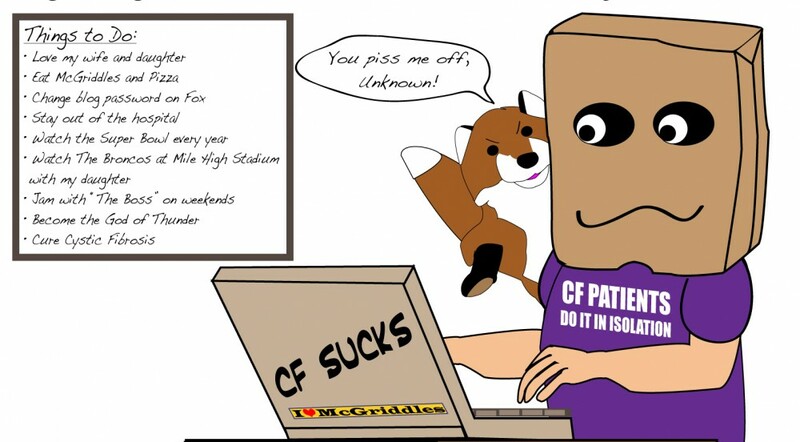 The realities of CF always seem to overcome me and I go back into hiding and come out with a new identity. We’ll see. It’s strange how you can care about people you’ve never met, but frustrating that you can’t do more to help them. Be well. Take care of your mother. 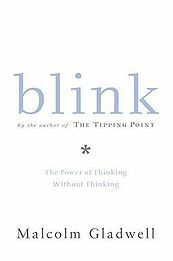 In his book Blink, Malcolm Gladwell explains the importance of thin slicing or rapid cognition in decision making. He states that these terms are not “gut instinct,” but rather an educated decision made quickly based on the conscious and unconscious minds. And, rapid cognition is usually more trustworthy when making decisions than an analyzed decision made over time. What’s interesting is how Blink applies to battling cystic fibrosis. What facts do we really have to go on with CF? We have our interpretation of the facts and others’ interpretation. Apologies to Mr. Gladwell, who can call it what he wants, but we need our CF “gut instinct” to help us make decisions. Example: On cysticfibrosis.com last night, a mother of a CF child asked about the order of meds her clinic was recommending. I replied with my order and logic. A man replied with the opposite order. Who am I to tell him that pulmozyme before HTS doesn’t work as well as HTS before pulmozyme? He says it works best that way for him. Who is correct? Or, jokingly, who is more correct? We are given some tools (meds) by doctors with some guidance, and we choose some of our own, such as supplements. Many times, it’s up to us to determine which tools to apply and how to apply them based on our research, our experience and our gut. The mother was questioning the clinic’s decision because her experience, or gut instinct, told her their decision was incorrect and less effective. Now guess which group of professionals “thin slices” daily. They’re highlighted in the book – doctors. Doctors need to make fast decisions. They interpret the evidence and what it tells them, then go with it, rarely second guessing. Bang. That’s it, patient diagnosed. Move on. Have you ever experienced the moment with your CF doctor when you’re trying to decide whether you need to be admitted or not? The decision is borderline, hovering, waiting to be made. Some signs point one way, some the other. What tips the scale one direction or the other? You sit there thinking, processing, clock ticking, looking at your doctor. Who blinks first? Your gut, or your doctor’s? Last night, Fox came to visit. Fox: Why are you sleeping? Fox: Your PFTs went down. Fox: What are you going to do about it? Me: Cry like a baby. Fox: This could be the beginning of a bad trend. Me: Crying or falling? What can I do? 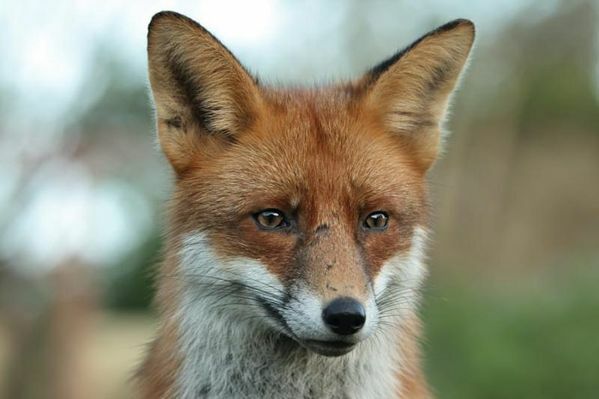 Fox: You’ve fallen before. Get back on the bike, literally. Fox: There’s always a trade off. I sat in the dark, thickheaded, and pondered what the annoying trickster had said. Do I have any tricks left of my own? Feeling tired today from the battle with @cysticgal. It could just be the cipro, day 7, or the Old Milwaukee, bottle 7. 11) Describe the perfect hospital stay. My first answer would be: Not going at all. But considering I’ve been going every four months, here’s my answer for today. I want everyone to line up in the hallway when I arrive, Nurses, Doctors, techs, RTs. Stand in the hall and greet His Highness, please. My antibiotics need to be ready to go the minute I arrive, no waiting four hours for the first dose. The PICC line nurse needs to be waiting in my room and gowned up. No more temporary peripheral IV sites. I’m tired of the 24-hour IV site in the fatty part of my forearm that takes every o.z. of my inner reserve not to cry out like Mel Gibson at the end of Braveheart: FREEDOM . . . . . S**T, THAT HURTS. I want a workstation. No more putting the laptop on the bed and pulling the chair up to it. Think Marriott. I want a massage every day. You truly want me to feel better? Massage is the Disney Fastpass to good health and Heaven, my friend. Heaven. I’ll cough up mucus from 1969 if you do this for me. No RTs. That’s right. Unless I can’t move my arms, give me all of the meds I need and come back in 14 days. I can do it myself, LIKE I DO EVERYDAY OF MY LIFE. Most of the RTs I know should be wearing brown UPS outfits because their only job is to deliver stuff.